Do you remember changing schools during your childhood? Sometimes it was fun, and sometimes it was scary. Ideally, we’d all move during the summer to avoid this scenario, but sometimes it’s just not possible to do so. When your child is starting a new school in the middle of the school year, there is a learning curve for everyone involved. Take comfort in the fact that you aren’t the only one doing this. Reach out to your “village,” and see what has worked for other families. Talk to your child’s teachers, old and new, and see what they suggest. If you moved midyear as a child, ask your mom what tips she may have, if possible. Here are five tips for helping your child transition to a new school midyear. 1. Communicate. It is no shock to your kid that he or she will be the “new kid” at school. Some kids will have gone through this before, and others will be experiencing it for the first time. Chances are your children will feign a happy face right up until the moment they break down. Then, the tears are like a tsunami. They’re excited, they’re nervous, they’re happy, they’re scared, and they have no idea how to express any of it. When the breakdown starts, the most important thing you can do is listen. Let them pour out their hearts and hear them out. They don’t want you to fix it, they just want you to be there. 2. Take a picture. It’s the first day at a new school, and your first-day-of-school traditions should be done, again. If you don’t have back-to-school traditions, start some! Maybe you go out for dinner the night before, buy a new outfit, or drive them to school that first day. Pack a special treat in their lunch with a message on the napkin. Or plan an ice-cream date after school to talk about how the first day went. If you have more than one kid, try to spend time with each one. Incorporate these back-to-school traditions this time, too, and be sure to take a picture! 3. Get involved. You know all of those things your kids loved at their old school? Have your kids try them at their new school. Sports, music, chess club, etc.—get those kids involved. As they meet more people, they’ll feel more comfortable, and those clubs and teams can help make that happen. Of course, if they are adamant about not trying something, let them make the decisions, especially if they are interested in something else. The new school may have more activities, which could open up new doors for your kid. And you, Solo Mom, need to get involved, too. You can’t just rely on your kids to help you make friends. Volunteer in the classroom, chaperone a school dance, join the PTA (gasp! ), and get out there! 4. Establish new routines. Routine matters to kids. Although the school hours, uniform, or extracurricular activities may change, some things won’t. Make sure your kids know what you expect of them regarding their day-to-day activities: chores, homework, wake-up times, etc. Structure makes kids feel more comfortable and lets them know what to expect. And it helps Solo Moms, too. Of course, you’ll have to lay down the law the first few weeks to make sure they know you mean business, but you can handle that. 5. Be patient. Change is hard on everyone, and it takes time. The first day, or even week, could be hard. Don’t jump to conclusions, and don’t go rushing in there to “fix” things. Let your child find his or her way. Now, if there is any bullying or serious problems with discipline or the curriculum, get in there, but realize that sometimes kids can work things out better if adults don’t get involved. Younger kids are more likely to make the adjustment easier than older kids will. Middle school is just plain hard, and high school is, well, you remember. Choosing a school when you move is incredibly stressful. There are so many things to consider, well beyond the first year. 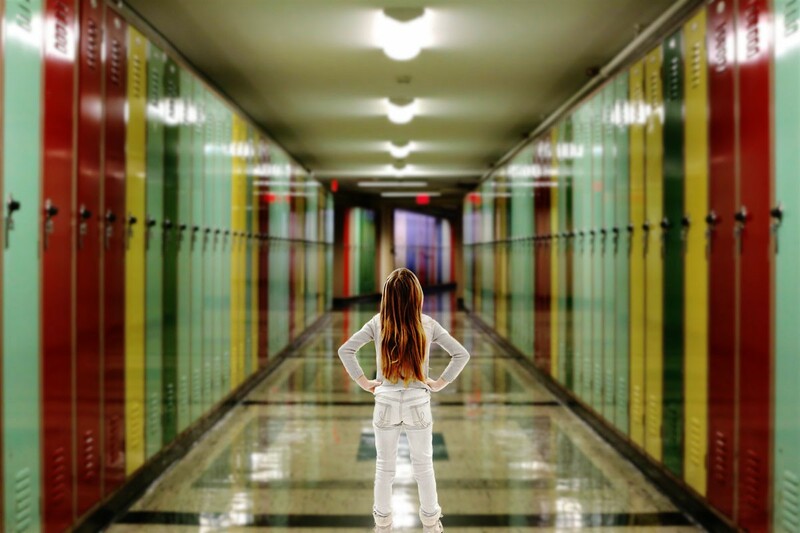 When you are focusing on elementary schools, middle and high school are often far from your mind, but they are just as important, if not more so. Consider some of these tips when choosing the next school. Military Solo Moms may have a completely different situation on their hands. For those children, this may be the norm. If that’s the case, switch the focus to educational concerns, not social ones. For military families moving during the school year, there are some great resources available through each school liaison officer and the Military Interstate Children’s Compact Commission. When considering your options, some of this information may help. And hey, military Solo Moms, help the rest of us out and and offer up some great tips! As Solo Moms, we know our kids pick up on every new thing and changes in our stress levels. Try to incorporate some of these tips when your child is changing schools midyear. Remember that kids are resilient and adaptable, and that although we worry for them, this can be a great experience for them.